As you know, I’m a mom to two wonderful boys. And as you also probably know, I adore the sheer act of making. Sewing, embroidery, crocheting, jewelry-making, you name it (except knitting, ugh, never knitting)… Even before I had kids, I knew I’d want to share those skills with my offspring and make things with them. Although I don’t fall into the trap of thinking crafting is a women’s only activity, I will admit to several moments of panic in Munchkin’s early days as I considered what might catch my his interest in lieu of cute twirly skirts, doll clothing, and hair bows. In my case, it turns out I needn’t have worried about sparking their desire to learn. My kiddos watch me make things and they want to try it too. As you might expect, I end up masterminding the projects, supervising heavily, and in some cases doing the fiddly bits that little fingers fumble. 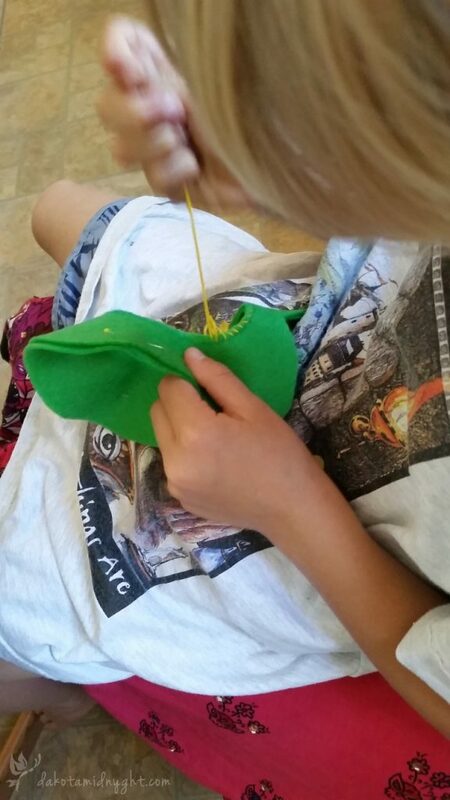 But over the years, my oldest has progressed from sitting in my lap while I’m sewing to sewing on his own. I can’t take all the credit, of course, but there’s a few things I’ve consciously done that I think helped us get from Point A to Point B. (Jewelry Making) Stringing pony beads (the large beads with with really large holes) on pipe cleaners. Pipe cleaners are stiff enough to hold a point, and the ends can be twisted together to make necklaces, bracelets, headbands, stuffed animal collars, etc., really easily without using clasps. (Art) Giving them my discarded sketches (or sometimes downloadable coloring sheets I’ve made) to color while I’m drawing. My kids tend to prefer coloring sheets that I’ve made instead of regular coloring book pages, and feel like it’s a collaborative process to color something I’ve drawn. (Sewing) “Sewing” with yarn or embroidery thread on a plastic needlework canvas. Use short lengths threaded on a large, blunt-tipped tapestry needle and tied off to the canvas. I found that yarn was a better choice for preschool ages than embroidery thread because it is harder to snarl. I used a double thickness so he couldn’t pull the loose end out of the needle. Now that he’s older, we’ve moved on to a single thickness of embroidery thread . It’s easier for him to practice with, still is less snarly than thread, and is kinder on little fingers! Although it’s admittedly so. much. more. difficult. to demonstrate techniques while also wrapping your arms around a wiggly, bony kid, I’ve found it’s easier for my kids to learn fine-motor skills if they’re on my lap. I think the front and center demonstration is easier for them to absorb. Munchkin will watch, then try it with my guidance. It’s also easier for me to adjust his hold on a needle, coach his stitch placement, and steady a project. Every time I’ve tried a side by side project, we’ve gotten frustrated with the awkward positions involved. If we’re creating a totally new design, I only offer my guidance when the materials just won’t work a particular way. Otherwise, I ask for his guidance on how details should look. 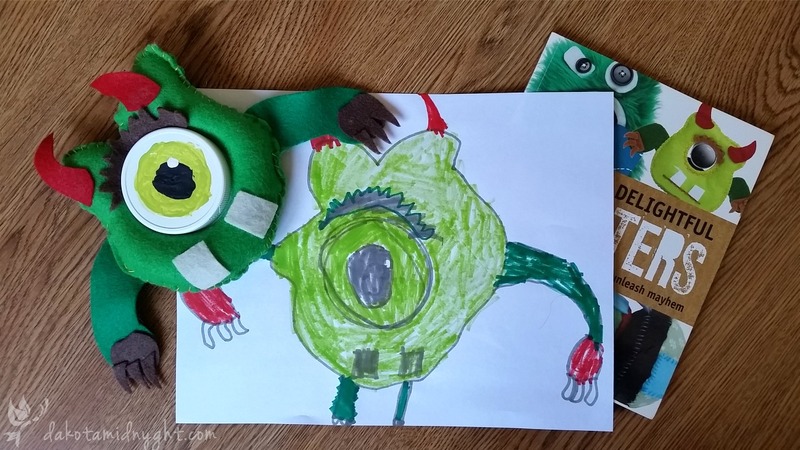 For kit projects, I encourage Munchkin to make them his own by asking his opinion on details, adapting the project with materials we have on hand, and brainstorming different applications for the end result. 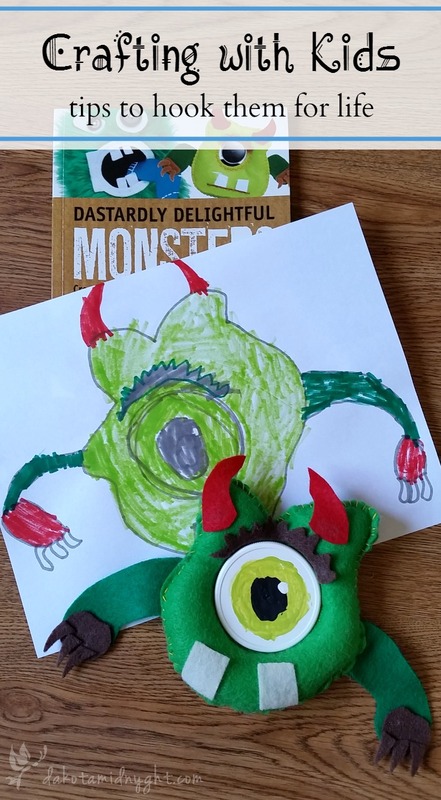 Sometimes that is sometimes easier said than done – my kiddo had it stuck in his head to make this decorative webcam monster EXACTLY the way the book said it should be done. (Thankfully, we don’t have a circular webcam, so we ended up drafting our own – but similar – pattern and using a painted jar lid for the eye.) But I’ve seen results in other areas when he picks up craft supplies we have lying around and makes unexpected things. 5) Let Go of the Craft Outcome Before You Start. This is the single biggest tip I could possibly pass on, and it’s also the hardest. I’m pretty precise with my own projects – I want something to look just so when I’m finished. That doesn’t work with kid projects. I’ve found that the less attachment I have to the end result, the more fun my kids have, and the easier I breathe! What about you? What kind of projects do you do with your kids? How have you adapted adult projects to be doable with little ones? I’d love to hear about it! Yes! Great post. #5 is so important, and as adults probably the most challenging to do with your kids. But it’s how they really expand their creativity! I used to wear Eve while I made jewelry. Sadly she doesn’t watch me much while I make it, though I talk to her about the jewelry I make, and she has her own supplies. Bev, thank you *SO* much. That is awesome that Eve has her own supplies. I can imagine that in a couple years she’ll really take off in that direction with such a creative & committed to her creativity Mama! I wish you could meet my Rebecca who is SO crafty even though I do not so much as even color. I wish I could too! Isn’t it amazing how kids can have so much aptitude for something that parents don’t? My oldest boy is a heck of a good athlete – but I’m not sure where he gets it from!